Aliens, experimentation, shininess. What's not to like? 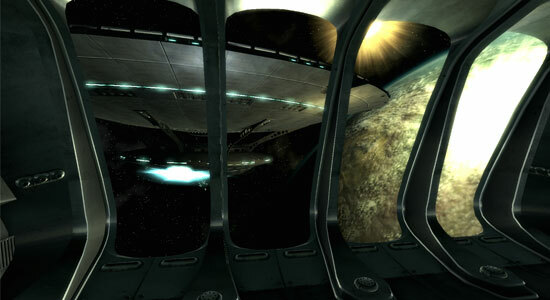 othership Zeta stands as Bethesda Softworks' fifth piece of DLC from Bethesda for Fallout 3. Once again, Bethesda's managed to deliver a stellar experience. Bad puns aside, Mothership Zeta brings a whole new environment to play in, even if it's a little too linear. As with past DLC additions the new content becomes accessible when you receive news of a mysterious radio broadcast. In this case the origin is an alien crash site, quite possibly a place that many people may have missed during their excursions in the Capital Wastes. When you reach the crash site you'll be abducted by aliens and in a hazy white light find yourself getting experimented. You're not the only one that the aliens have abducted; in fact, it's been going on for hundreds if not thousands of years. Unsure as to what the aliens' motivations actually are, you'll have to lead a ragtag group of escapees from across earth's history to try and escape the mothership. from across human history.As with past DLC packs, Mothership Zeta adds the same kinds of new content: new weapons, new enemies, and new perks to earn. This time around Bethesda's created a whole new pallet of textures to use, making exploring around the mothership feel like a whole new experience compared to what players have seen going through the Capital Wasteland. Technology in the ship is extremely advanced and bright — so different from the constant layer of dirt that seemed to cover the rest of the Fallout universe. And then there are Mothership Zeta's new enemies. They more or less seem to be a bit more resistant to damage than anything else you've been exposed to before, and they're particularly dangerous in groups — a good warning to give since they almost always attack in groups. This does become particularly challenging on the higher difficulty settings. group off the mothership.Mothership Zeta falls between what we've seen before in Operation Anchorage and The Pitt: a relatively linear affair with a handful of exploration choices. You'll have to search the entire ship eventually, so those choices really only amount to what do you want to get through first. The whole experience ends in a massive space battle that's a lot less exciting than you'd think — but without my spoiling too much, the payoff for winning is spectacular. One last note is for the voice work done for the new characters and the captive logs. They were extremely well done and conveyed a lot of emotion; Bethesda made excellent casting choices. Those who've only dabbled in the Capital Wasteland, you won't be missing out on too much. Those still enjoying Fallout 3 then you've already downloaded the new content — aside from a linear experience, what's not to like?